Today we hit you with a brand new surprise update! Featuring a new raid, new items and of course a number of bug fixes and quality of life updates! The date is the 5th June 2006 and you have been invited to celebrate Cursed You's achievement of 99 construction! 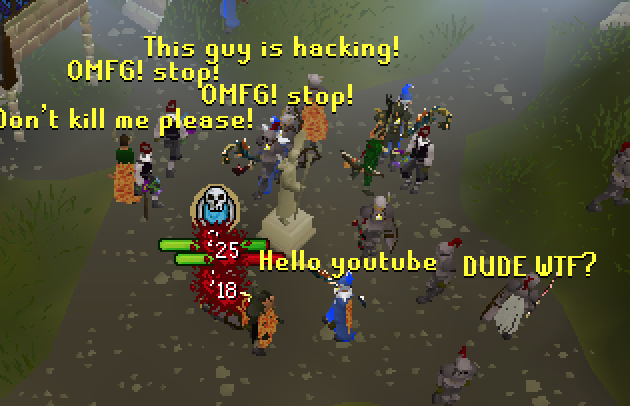 However, due to a glitch in the system, you are able to attack people outside of the wilderness! 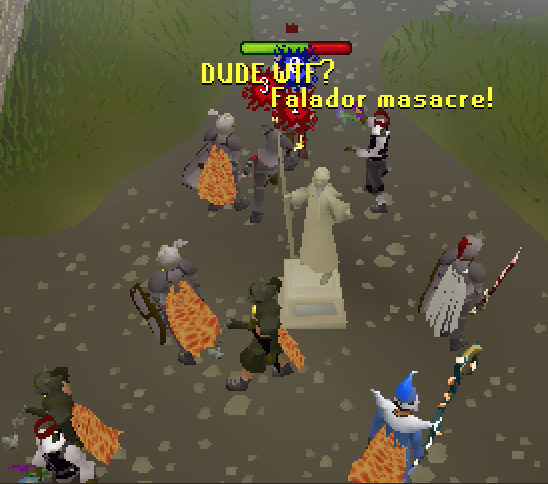 Give in to this nostalgia-inducing PvM mini-raid and take on the Falador massacre raid! 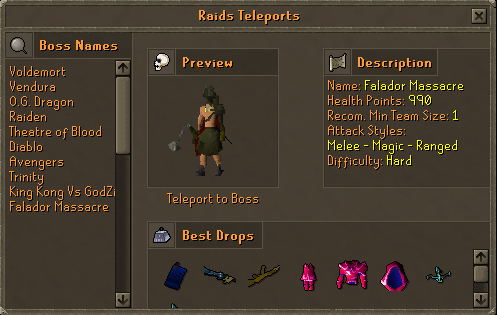 To start this raid, click on the Falador Massacre teleport in the raids teleport interface! 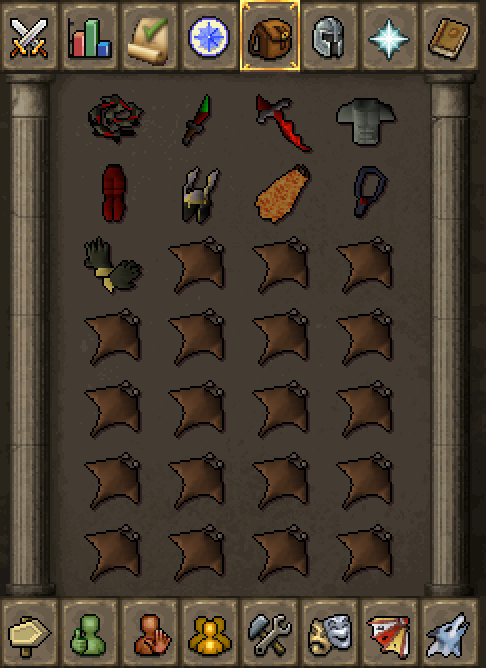 You must have no items equipped and will be provided with a preset of OSRS PKing gear. Take on the other players (fully automated AI Bots) and fight to the death! Should you be the last man standing you will be rewarded with some juicy goodies! Including new Range set and new skilling gear! Gives you a chance of getting 25b when woodcutting! Gives a chance of getting 50b when mining! We haven changed the way in which exp lamps work! The exp they give is now directly dependent on your skill level. The exp given per level is 100 x your skill level. e.g. For lvl 1, exp lamps give 100 exp and for lvl 99, they give 9,900 exp. Exp lamps still stack with your exp boosters (e.g. Double Exp Ring, Exp Potions and the Well of Fortune). This is part of our drive to make skilling a larger part of the server! We will be following this change up with full customizations of skills, so prepare yourself for some very juicy skilling content in the coming months! Today we introduce a really exciting new donation box! This interface led box and goodiebag fusion puts the decision of which prize you will get in your hands! There are 7 Goodieboxes available with more coming in the future! 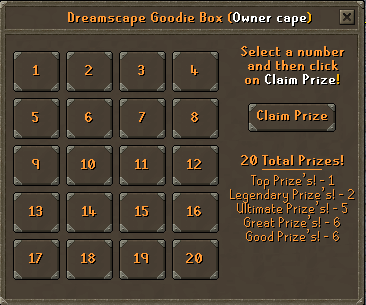 Each goodiebox is themed on its top prize! After selecting your number click claim prize to see what you have won! With a 1 in 20 chance of hitting the top prize, this box is one of the most OP we have ever put out! The seasonal goodie box will include a seasonal and rotational item that we will frequently update! 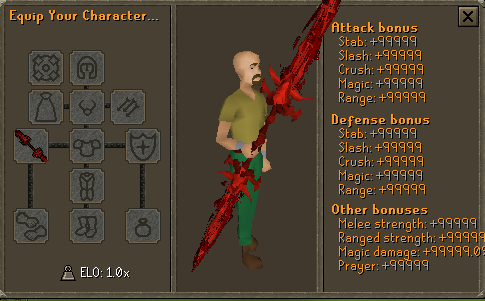 The first item to be added to the seasonal goodiebox is the Blood Khiones Staff! Once it has been won, it will be removed from the box... Forever! Don't miss out, try your luck today! A reminder about our platinum partnership! This highly exclusive club just got more executive. With a free additional custom item for the first person to be accepted. If you are the first platinum Partner, you will get a free custom item worth over $2000 that will be hand designed by Chuck and Drax! For more info on our Platinum Partnership type ::platinum in game or click on the link below! - We have added diglet to the boss teleports! - We have fixed a number of bugs with diglet, he will now drop where he dies. - We have fixed the ::edz and ::ez commands for extreme donators! - We have placed a crystal chest in ::soulroom to make it easier for those who want to open multiple keys and cash in their items in the soul well! I thoroughly remember this day. Holy nostalgia! Well done. Naughty update! How tempted are certain folks to blitz $5k this month for that juicy custom........ ?? If i wasn't uprooting and moving country in 2 weeks I know i'd be tempted for sure!! Awesome can’t wait to be able to hop on! I agree with @Athene, again alot of donation updates (try 1 update without extra donation updates). you guys make enough money already. takes waaaay to long and you still get the same normal loot as the other raids and the other "new armour" parts are also at the same rate as the other raids, so not even worth doing that raid. Hmmm. So I was thinking of way's to improve on this new minigame since it takes a very long time to complete. 1. You could add perks into the minigame. Every time you complete it, you would get a point from completing it and you could spend it on perks Ex. (Double hit, Extra damage, Spawn in with a slightly better item rather than abyssal whip and dragon dagger, 2x points, maybe have only 2 perks active, so that it wont be too easy etc.) The more you complete this, the more points you get to earning perks. 2. On my first completion, It took me about 8-10 minutes just to finish all 3 waves. I ended up getting awarded with Vanguard gloves (Bank made). It was depressing just seeing that I put all that time and effort for something that is 1b. 4. What ever happened to the abyssal sire raid? @Rhys Well since it only takes you 2 minutes to complete. I would love to see you make a video guide on how to complete it so quickly. Only would take a few minutes out of your day to make. You can't bring items into this new raid. Unless its a glitch or bug abusing. Fally massacre is a fun idea but think it has some way to go before it is something alot of people jump onto as Raptor mentioned a couple of ideas I think it may need some tinkering. Got to be honest at the moment lamps seem abit sucky and I know everyone is a little bummed out of them but I am exited to see what direction the server is heading to give people more incentive to skill etc! Platinum partnership benefits look unreal and that custom set and donation for first person will make me envy them tbh! Alsom Gz to Winter51 on the naughty Blood Khiones pull earlier! 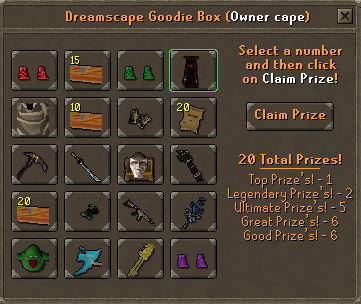 Still some really juicy goodies in seasonal goodiebox! !